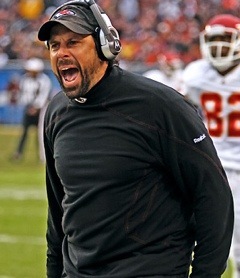 The Steelers have signed former Chiefs head coach Todd Haley today to become the team’s offensive coordinator. You might also remember Haley because he was the OC for the Arizona Cardinals during their miraculous playoff run in the 07’-08’ season. Many might look at this as no big deal and if you do you are certainly mistaken. Haley is one of the top offensive minds in the league today, and having him take over an already potent Steelers offense certainly worries me as a Patriots fan. The Steelers rarely make big signings outside of the organization, but I definitely think this move will pay off. In Arizona, Haley worked with the Kurt Warner to Larry Fitz combo. He certainly has a similar combo here talent wise with the deep threat from Roethlisberger to stud receiver Mike Wallace. When this offense is at full health expect big things this year. This entry was posted in Everything Else and tagged boston sports blog, cardinals, chiefs, coach, haley, roethlisberger, signing, steelers by davecouture. Bookmark the permalink.